According to Forrester Research, 76% of consumers are using online self-serve to find answers—more than any other support channel, including phone. And they are no longer just looking for customer support directly on companies’ Facebook or Twitter sites. They are seeking help from their peers for quick and easy answers. 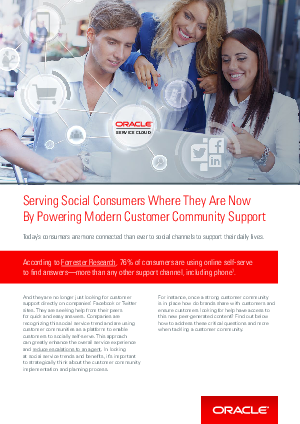 Companies are recognizing this social service trend and are using customer communities as a platform to enable customers to socially self-serve. This approach can greatly enhance the overall service experience and reduce escalations to an agent. In looking at social service trends and benefits, it’s important to strategically think about the customer community implementation and planning process.